The 3G service will be available in the US through AT&T for $14.99 for 250MB per month or $29.99 for unlimited per month. There is no contract and no cancellation fee. The iPad will be unlocked so you can use it with any carrier that supports micro SIM cards. It’s also a data only connection. There are possibilities of VOIP calls but no phone app comes with it. I didn’t think of using MyWi great idea I will do that thanks. If it had a camera (for Skype or iChat) and Flash like my netbook it would be a wrap. I am very disappointed. I was really looking forward to the product. Oh well. the reason this will do well is because it will simply revolutionize the textbook industry. a few years down the road and you will see many high schools (and 99% of wealthy high schools) and most colleges adapt to this type of system. any hs or college student salivates at the idea of bringing this around with having virtual copies of every book (that will take up less than a single gb total)… hello new standard. I dont see the 3g a good selling point unless that have edge network also.. Which carrier is going to handle the networking? for a closed system?! Compare that to hackintoshable netbook for $300 max and $30 snow leopard install disc. Hey toNYc311, thank you for the advice. You are right. There is no point of buying this if it does not have the WiFi in it. As far as the pricing goes, this is too expensive. 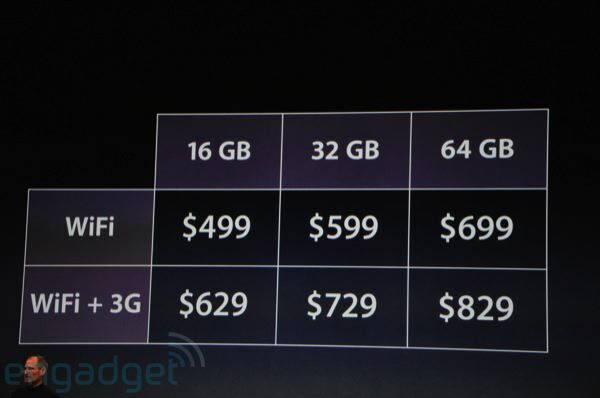 Apple has to reduce the price if they really want to sell this. When they say 3G that’s in addition to Edge & Wifi. This iPad will do well, consider schools, realtors that can access the MLS while walking through a house showing it, use it on the treadmill, keep the kids quiet on trips, makes a bigger GPS for the passenger navagater, the uses for this device are endless. But in order to see that we will need to look at not such a self serving use. Really no laptop or iPod touch or iPhone is needed but we have wanted, obtained, & made them into a need. Sit back and watch this thing take off. Poll: Will You Buy The New iPad?